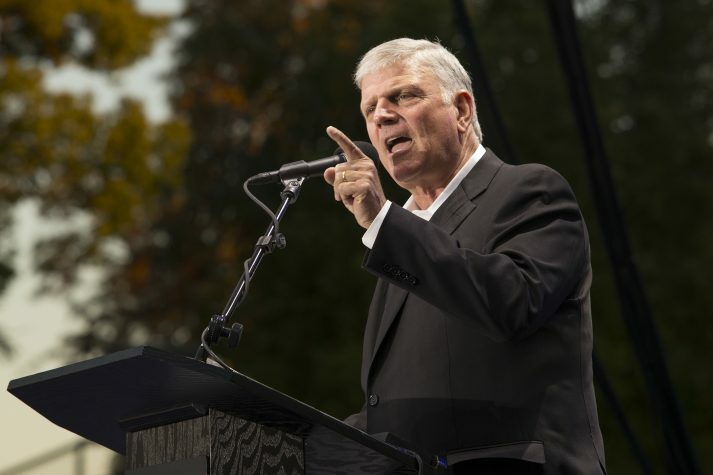 Youth were among the hundreds that made decisions for Jesus Christ during the fifth stop of Franklin Graham's Decision America California Tour in Fresno on Monday evening. The tour next heads north to Modesto, and the Tuesday prayer event will be streamed live at 7:30 p.m. PT/10:30 p.m. ET. Ashley Castro, a young mom and military wife, couldn’t believe her eyes this Memorial Day. Franklin Graham had just finished teaching from the Bible that religion was not the answer during Monday’s Decision America California Tour. Religion, he said, couldn’t save Nicodemus, a Pharisee who sought Jesus’ advice in the Gospel of John, and this idea of strict rule following couldn’t save the people sitting under the setting sun in the theatre at the Fresno Fairgrounds. It’s about a relationship with Jesus Christ, Franklin shared before leading the crowd in a powerful prayer of salvation. 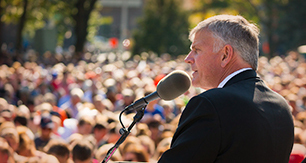 “If you prayed that prayer, I want you to stand up,” he encouraged people of all ages who had just decided to accept Jesus Christ as their Lord and Savior. Ashley’s 6-year-old daughter Alyssa rose to her feet. Ashley gasped. Ashley’s husband Ryan Castro, petty officer first class in the Navy, definitely saw their oldest daughter stand for Jesus. Faith is a critical part of Ryan’s life, and it flows into his job serving our country. Before Monday’s event, he and his friend Tim Spiller, petty officer second class, talked candidly about their faith. The two often exchange Bible verses by text during the day as they challenge one another to grow spiritually. They also try to share Jesus whenever possible. So when his daughter stood up, Ryan doublechecked with her—are you sure? She was, so they went to talk with a prayer volunteer. And Alyssa still remained committed moments afterward. Why did she choose to stand for Jesus? “I wanted to,” a smiling Alyssa later said softly, but matter-of-factly. The crowd that numbered over 5,000 mostly filled the Fresno Fairgrounds theatre and seemed younger than prior Decision America California Tour stops, as many families brought their children to hear God’s Word proclaimed. Rows away from Alyssa, 6-year-old Olivia rested in her mother Lyuda’s arms. Just this weekend, Olivia asked her parents how she could become a Christian. And on Monday night, she made her own declaration just days ahead of her seventh birthday. “Jesus made us and He loves us,” Olivia spoke up, standing to her feet on the metal bleacher. The joy, the simplicity of that truth lit up Alyssa’s and Olivia’s faces, served as a motivating reminder for parents and grandparents to continue praying tirelessly for their children, grandchildren, the school system and other elected officials. Melvin Schooler of nearby Madera believes that. He wants his grandson Clark to have a Biblical worldview, so he prays for the educational and political leaders shaping his future. Every Sunday, Melvin attends church with his grandson. He figured Monday’s prayer event was a chance for the 12-year-old to hear the message of God’s love in a different way. The world never ceases to present challenges, stumbling blocks to God’s Word. But Maria Martinez, standing with her children at her side, said she’s not worried. Stop worrying. Find peace with God today. 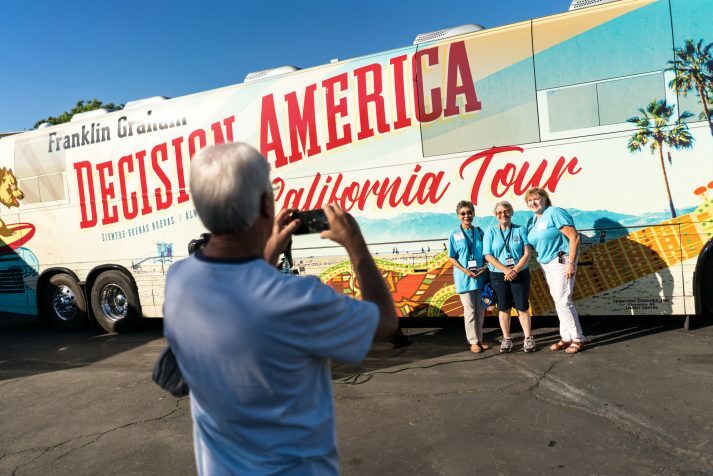 Fresno marked the fifth stop of Franklin Graham’s Decision America California Tour, which now rolls north to Modesto. 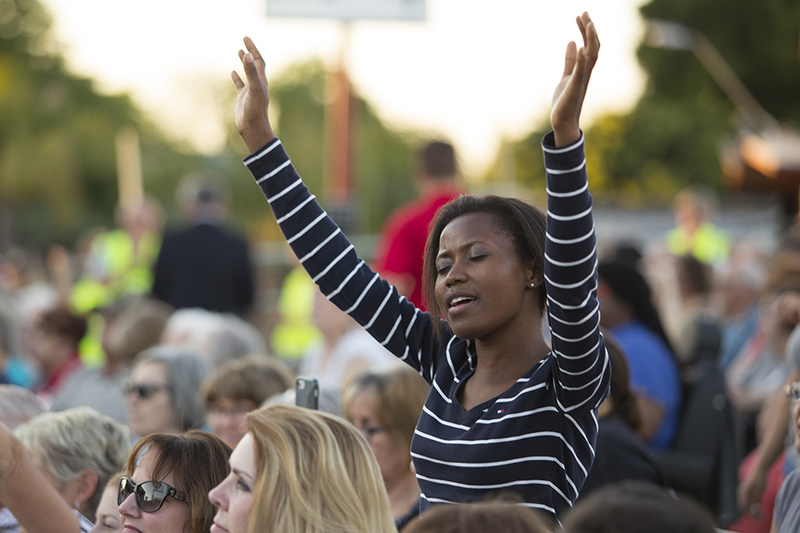 If you can’t attend Tuesday’s prayer rally, please pray and watch the 7:30 p.m. PT event live from wherever you are.